Jackie Chan was the king of Hong Kong martial arts action flicks for a longtime running, and with good reason. 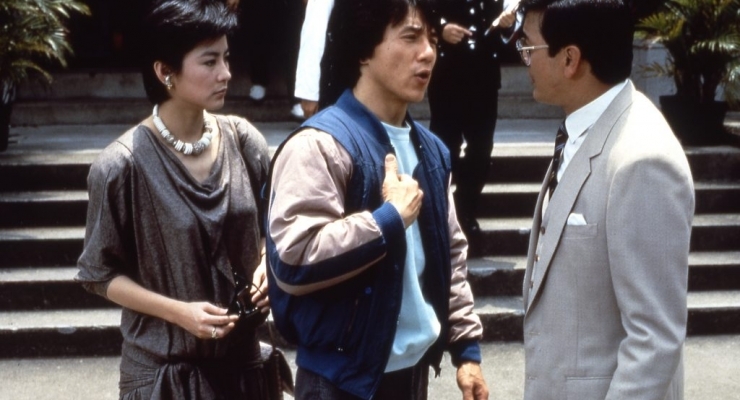 The Police Story films are two of the best martial arts action films out of Hong Kong (and out of the 1980s) and set Chan up with the international success that he would maintain to this day, parlaying that success into blockbusters like Rush Hour. In this collection of the newly restored original and sequel, Chan’s prowess and a martial arts entertainer is in top form as is his unique ability to combine action, crime drama, and comedy in one accessible, charismatic package. The first film introduces us to the character of Chan Ka Kui (Chan), a by-the-book cop who becomes a hero when he aids in a big drug bust. Tasked with guarding the key witness in the prosecution’s case, the seductive and challenging Selina Fong (Brigitte Lin), Ka Kui is eventually framed for murder by the drug lord and must go rogue to clear his name. Without giving away any spoilers, it’s not too difficult to figure out how it all works out, because Jackie Chan returns again as Ka Kui in Police Story 2. This time, the virtuous cop who gives his commanding officers (and his girlfriend May, played by Maggie Cheung) the fits must help stop a mysterious, blackmailing bomber while also skirting the violent retribution of the mobsters from the first film. These films are classic Jackie Chan and highlight all the elements that Westerners would come to enjoy in films like the aforementioned Rush Hour or Shanghai Knights, only more concise, less constrained for Hollywood purposes, and Chan is lot fitter and quicker. The stories are more well written than some other early Chan efforts like Hung fan kui, later re-edited, re-dubbed, and reissued in 1995 as Rumble in the Bronx, although it was very obviously filmed in Vancouver. The Police Story films arrive in new 4K restorations framed at 2.35:1 in AVC 1080p encodements. They both look fantastic, with excellent clarity and detail, organic grain structure, and a clean image. The contrast is strong and shadows ae nicely nuanced. This is one fine restoration for two films from the mid to late 1980s. The Police Story films come with DTS-HD Master Audio 5.1 remixes in Cantonese and English dubs as well as the original Cantonese mix in LPCM 1.0. The 5.1 remixes sound generally good and well-balanced, but they have an issue with the audio syncing that is distracting. The original mono tracks are strong – as well as more authentic for those traditionalists out there – and suffer far less from the audio syncing issue. Eureka Entertainment comes through with a massive collection of special features including multiple and rare versions of the films, audio commentaries, extended scenes and an exclusive booklet with writing on the film. Japanese Cut (105 mins., HD) – This version was originally released on home video in Japan. It was transferred to HD from a film print in 2012 and makes its UK debut in this release with Cantonese audio and English subtitles. “Police Force” – US Video Version (84 mins., SD) — A unique cut of the film done exclusively for home video in the US featuring a unique English dub and electronic score. Jackie Chan – Son of the Incredibly Strange Film Show (1.33:1; upscaled 1080p/24; 00:41:08) – Originally aired in 1989, this episode of Son of the Incredibly Strange Film Show is presented with the kind assistance of Jonathan Ross. Both the original Police Story and its sequel are immeasurably enjoyable popcorn films that shine a light on why Jackie Chan is such an international star in the martial arts genre and beyond. This se from Eureka Entertainment with its new 4K restorations looks gorgeous and the new 5.1 audio restorations sound solid, even if the audio syncing issues are more prominent. Hero cop Chan Ka Kui (Jackie Chan) is first framed for murder and must go rogue to clear his name (Police Story) then must help find a blackmailing bomber (Police Story 2) while dealing with with the criminals from the first film, in this wonderful double-feature of the classic Jackie Chan films, here newly restored in 4K and presented fantastically in a feature-rich set Blu-ray by Eureka Entertainment.